Christmas is celebrated to remember the birth of Jesus Christ, it is an annual festival observed most commonly on December 25. This is a huge religious and cultural celebration among billions of people around the world. People around the world erect Christmas trees, decorate their homes, visit family or friends and exchange gifts along with feast. Enough about the Christmas .. now let us see the most beautiful, illuminating and astonishing Christmas trees around the world ranked in Top 10. These Top 10 Christmas Trees around the world will drive you crazy 😉 Here you go..
One of the most illuminating Christmas tree at the Brandenburg gate steals the heart of millions. The city lights up high during the festive season to impress people around the world. The Christmas tree in the New York city is another center of attraction. Christmas Tree at the Rockefeller Centre is measuring 76 feet tall, 47 feet in diameter and weighing a total of 12 tons. The Rockefeller Christmas Tree is a world-wide symbol of the festive season that appears every year in the Big Apple has been decorated with more than 45,000 multicolored, energy efficient LED lights. Paris is popularly known as the fashion city. 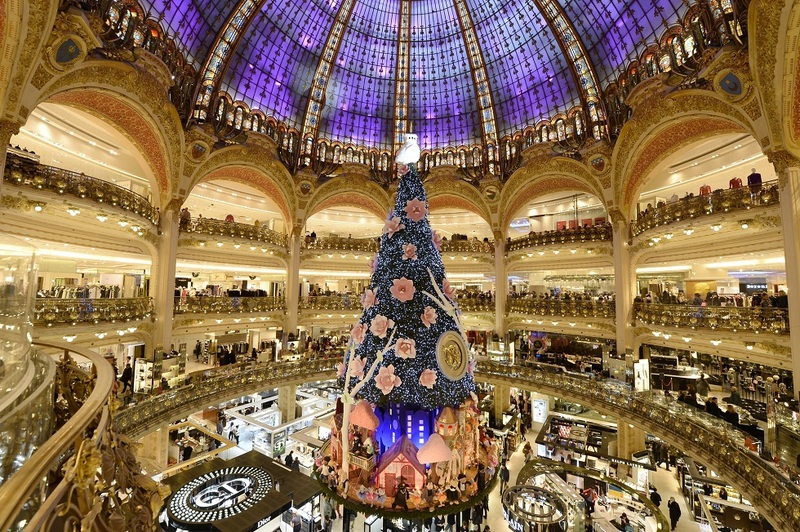 But the four-story Christmas Tree at Galleries Lafayette is one the most fascinating and stylish Christmas Trees around. The city of lights is more enlightened during the festive season. Madrid is a place where people gather in large number to bring in the new year. The Christmas Tree in Madrid will take you to the world of imagination, it is 12 story- high golden Christmas Tree, which allow you to enter the Christmas tree. This golden Christmas tree is highly illuminated by energy efficient lights. The world’s tallest floating Christmas Tree welcomes the people around the world during the festive season. A grand total of 3.3 million lights sparkle on the 542-ton tree, which is the major attraction for the tourist visiting the city. The lighting of Christmas Tree light up the mind and soul of the millions during the season. Decorating the Christmas tree is the old American tradition. The giant Christmas tree lights up the grounds around the White House every year. London receives a very lovely Christmas present from Norway in support and friendship during world war two. The Grand Christmas tree is donated every year that stands in the center of Trafalgar Square. The most illuminating Christmas tree in Osaka light up in magical colors. 55,000 lights on the Christmas tree make for quite a dazzler on the Island of the Rising Sun. No wonder the Japanese have won the trophy as a record holder for the most lit up the tree in 2016. The Island of Murano brings glassware to life with their creative decorations on the festive season. Which is again a center of attraction around the world. This tree is entirely made up of glasses and looks beautiful. The Christmas Tree at the Colosseum is the most photographed and decorated trees in the world. This stunning tree draws millions of people to admire it. Hope you guys enjoyed reading about the Top 10 Christmas trees around the world, which attract a large number of people every year during the festive season. So, stop reading pack your bags! Make your Christmas and a new year the most memorable and remarkable this time. If you like my article like, share and mention your views about the article in the comment section. You can also check my other articles on Trabeauli Website. Great post as always. I really like the idea and colors of 4 Christmas trees in Rio! Also, have you seen the Christmas Tree of Vilnius, Lithuania? It’s a small country but an awesome Christmas tree – worth checking out! I think it is the first time they were exhibiting a glass Christmas tree at Murano. It’s unvailing was yesterday. Anybody lucky to have seen it?